The pulp and paper sector is one of the most energy intensive and highly polluting sectors and therefore is of particular interest to both local and global environmental discussions. The major share of energy which is needed in industrial production processes is below 250°C which could be easily supplied by Concentrated solar thermal(CST) technologies like ARUN solar boiler. The process whereby timber is converted into paper involves six steps. The first four convert the logs into a mass of cellulose fibres with some residual lignin using a mixture of physical and chemical processes. This pulp is then bleached to remove the remaining lignin and finally spread out into smooth, pressed sheets (often with chemicals added to provide particular properties such as colour or water resistance). The last step is paper making which consists of preparation, forming, pressing and drying of the paper. The operations of pulp making, pulp processing and paper making require large amount of thermal energy in the form of hot water (60 °C) or low pressure steam (up to 150°C). 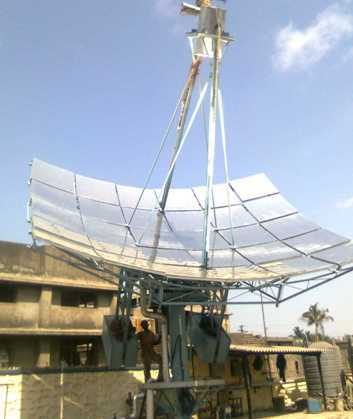 This requirement of the thermal energy can be easily fulfilled by the solar thermal systems like ARUN solar boiler. Along with the manufacturing process, the plant requires lot of energy for utilities and waste treatment plants. The major energy requirement is for the water treatment and effluent treatment. The following figure shows the schematic of the paper and pulp manufacturing plant. 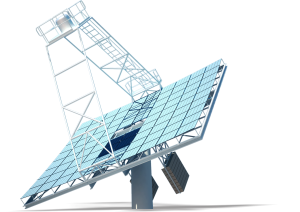 The processes with which solar thermal or concentrated solar thermal(CST) systems can be integrated are marked with (*).